Josh D. Weiss/The Red & Black Former Gov. Roy Barnes speaks to students during a Young Democrats meeting in the Student Learning Center Wednesday. 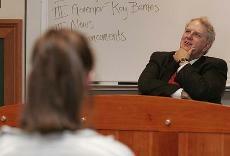 This past Wednesday, former Governor Roy Barnes spoke to the Young Democrats at UGA. For those of you who don’t know, Barnes lost his reelection bid in 2002, mostly due to three issues: the northern arc, teachers, and the state flag. Anyways, politics aside, Barnes speaking, mostly from behind the desk proved a bit difficult. I took a lot of close up shots that came out pretty well I thought, took a few wide angles from the back of the room, and tried some over the shoulder stuff as seen above. There are things I like about this photo, and things I don’t like. I think the crop is weak, it needs to end right above his head and come a little closer on the left side. While I like how I got the Roy Barnes written on the whiteboard, it just doesn’t work well with this composition. Also, I’m not sure if having the back of an unidentified student’s head is necessary. I think a portrait shot of him talking would have worked better for the story, or using one of the wide angle ones if it was a bigger picture. Apparently there is a saying that the subject’s head in print needs to always be at least the size of a dime. So the wide angle probably wouldn’t work well. Posted in News, Red & BlackTagged athens, georgia, roy barnes, student learning center, university of georgia, young democratsBookmark the permalink.